37 CFR 41.31 Appeal to Board. (2) Every owner of a patent under ex parte reexamination filed under § 1.510 of this title before November 29, 1999, any of whose claims has been twice rejected, may appeal from the decision of the examiner to the Board by filing a notice of appeal accompanied by the fee set forth in § 41.20(b)(1) within the time period provided under § 1.134 of this title for reply. (b) The signature requirements of §§ 1.33 and 11.18(a) of this title do not apply to a notice of appeal filed under this section. Effective March 19, 2013, the fee for filing an appeal brief in an application or ex parte reexamination (37 CFR 41.20(b)(2)(i)) was reduced to $0, and a new fee for forwarding an appeal in an application or ex parte reexamination proceeding to the Board after the mailing of an examiner's answer was added at 37 CFR 41.20(b)(4). See 37 CFR 41.45 and MPEP § 1208.01 for additional information pertaining to the forwarding fee. Under 37 CFR 41.31(a)(1), an applicant for a patent dissatisfied with the primary examiner’s decision in the second or subsequent rejection of the applicant's claims may appeal to the Board for review of the examiner’s rejection by filing a notice of appeal and the required fee set forth in 37 CFR 41.20(b)(1) within the time period provided under 37 CFR 1.134 and 1.136. A notice of appeal may be filed after any of the claims has been twice rejected, regardless of whether the claim(s) has/have been finally rejected. The limitation of “twice rejected” does not have to be related to a particular application. See Ex Parte Lemoine, 46 USPQ2d 1420, 1423 (Bd. Pat. App. & Inter. 1994) ( "so long as the applicant has twice been denied a patent, an appeal may be filed" ). For example, if any claim was rejected in a parent application, and the claim is again rejected in a continuing application, then applicant can choose to file an appeal in the continuing application, even if the claim was rejected only once in the continuing application. Applicant cannot file an appeal in a continuing application, or after filing a request for continued examination (RCE) under 37 CFR 1.114, until the application is under a rejection. Accordingly, applicant cannot file a notice of appeal with an RCE, even if the application has been twice rejected prior to the filing of the RCE. Although the rules do not require that the notice of appeal be signed, applicants may file notices of appeal which are signed. It should be noted that the elimination of the requirement to sign a notice of appeal does not affect the requirements for other papers (such as an amendment under 37 CFR 1.116) submitted with the notice, or for other actions contained within the notice, e.g., an authorization to charge fees to a deposit account or to a credit card, to be signed. See MPEP § 509. Thus, failure to sign the notice of appeal may have unintended adverse consequences; for example, if an unsigned notice of appeal contains an (unsigned) authorization to charge the notice of appeal fee to a deposit account, the notice of appeal will be unacceptable because the notice of appeal fee is lacking. Appeals to the Board in inter partes reexamination proceedings filed under 35 U.S.C. 311 are governed by 37 CFR 41.60 through 41.81. 37 CFR 41.30 through 41.54 are not applicable to appeals in inter partes reexamination proceedings. See MPEP § 2674 to § 2683 for appeals in inter partes reexamination proceedings. If an appellant wishes to reinstate an appeal after prosecution is reopened, appellant must file a new notice of appeal in compliance with 37 CFR 41.31 and a complete new appeal brief in compliance with 37 CFR 41.37. 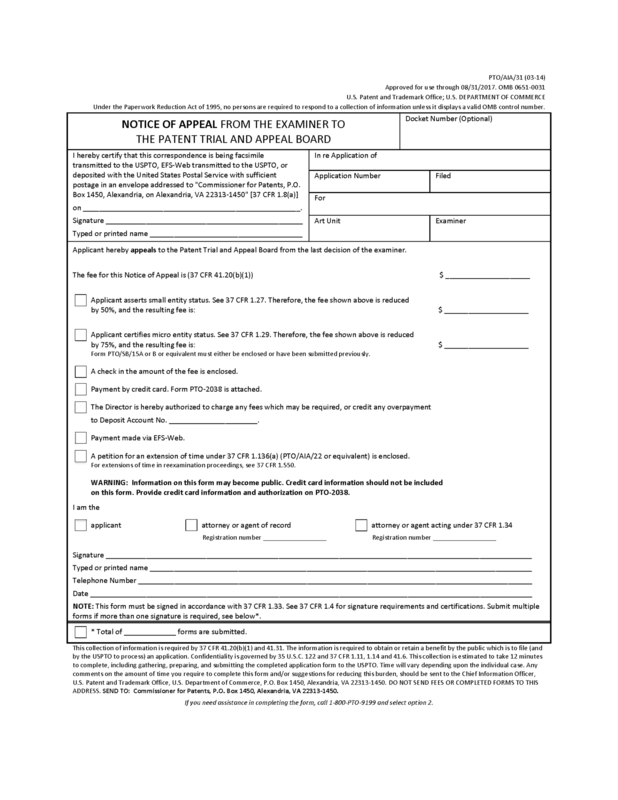 Any previously paid appeal fees set forth in 37 CFR 41.20 for filing a notice of appeal, filing an appeal brief (if applicable), requesting an oral hearing (if applicable) and forwarding the appeal to the Board (if applicable) will be applied to the new appeal on the same application as long as a final Board decision has not been made on the prior appeal. If, however, the appeal fees have increased since they were previously paid, then appellant must pay the difference between the current fee(s) and the amount previously paid. Appellant must file a complete new appeal brief in compliance with the format and content requirements of 37 CFR 41.37(c) within two months from the date of filing the new notice of appeal. See MPEP § 1205. Since July of 2005 the Office has provided an ongoing pilot program in which an appellant, upon the filing of a notice of appeal may also request a pre-appeal brief review. See “Pre-Appeal Brief Conference Pilot Program,” 1296 OG 67 (July 12, 2005) and “Extension of the Pilot Pre-Appeal Brief Conference Program,” 1303 OG 21 (February 7, 2006). This program does not apply to reexamination proceedings. Presenting a request for pre-appeal brief review does not change the fee required to file a notice of appeal and does not require a separate fee. No extensions of time to file the request for review later than the notice of appeal are available. 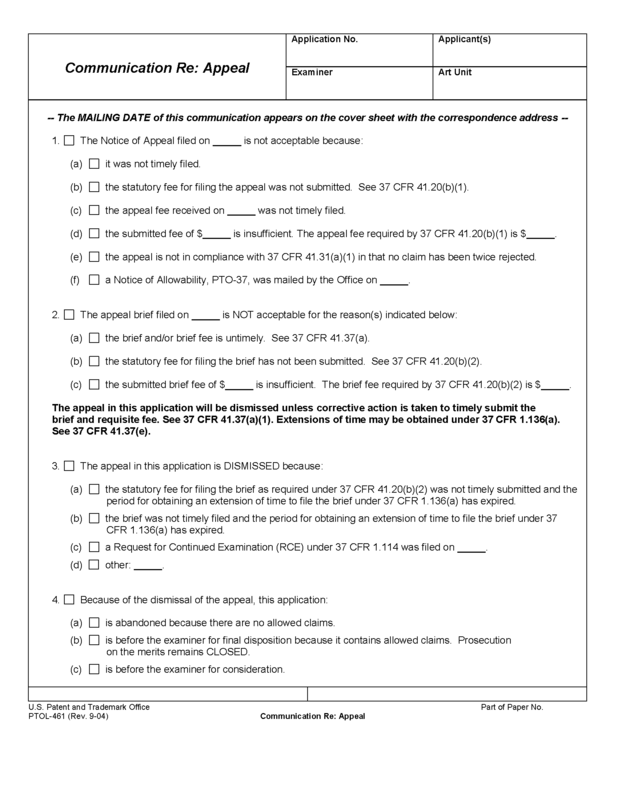 In order to be proper the applicant must file a notice of appeal in compliance with 37 CFR 41.31. The request for pre-appeal brief review must be filed with the filing of the notice of appeal and before the filing of an appeal brief. Form PTO/AIA/33, “Pre-Appeal Brief Request for Review” may be used for filing the request. The request must be accompanied by arguments in a separate paper entitled, “Pre-Appeal Brief Request for Review”. The request may not exceed five (5) total pages and should provide a succinct, concise and focused set of arguments for which the review is being requested. Requests are limited to appealable, not petitionable matters. See MPEP § 1201. A request that fails to comply with these requirements should be dismissed. Upon receipt of a properly filed request, a supervisor will designate a panel of appropriate reviewers to review the appellant's remarks and the examiner's rejections. The panel will include at least a supervisor and the examiner of record and will have the authority to reopen prosecution if appropriate. The appellant will not be permitted to attend the review and no interviews will be granted prior to issuance of the pre-appeal brief review decision. (A) The application remains under appeal because there is at least one actual issue for appeal. (B) Prosecution on the merits is reopened and an appropriate Office communication will follow in due course. In appropriate circumstances, a proposed amendment may accompany the panel’s decision proposing changes that, if accepted, may result in an indication of allowability for the contested claim(s). (C) The application is allowed on the existing claims and prosecution remains closed. (D) The request fails to comply with the submission requirements and is dismissed. The panel’s review will be terminated if the applicant files any of the following responses after filing a request, but prior to a decision by the appointed panel of examiners assigned to conduct the review. (B) A request for continued examination. (C) An after final amendment. (D) An affidavit or other evidence. After a panel decision, the time period for filing an appeal brief will be reset to be one month from the mailing of the decision on the request, or the balance of the two-month time period running from the receipt of the notice of appeal, whichever greater. Further, the time period for filing of the appeal brief is extendible under 37 CFR 1.136. For as long as this pilot program remains in effect, submission of a pre-appeal review request may extend the period for filing an appeal brief until a decision is made on the request or the request is otherwise dismissed. As indicated in MPEP § 713.09, one interview after final rejection is normally permitted. Where a notice of appeal is filed in an application or ex parte reexamination, the phrase "after final rejection" includes only the time from the mailing of the final rejection through the filing of an appeal brief. However, as indicated in the notice "Pre-Appeal Brief Conference Pilot Program," 1296 OG 76 (July 12, 2005), no interviews will be granted from the filing of a request for pre-appeal review through issuance of a decision on the request. See MPEP § 1204.02. Except in unusual situations, no interview is permitted after the appeal brief is filed. See MPEP § 713.05. Where an appeal brief is filed in an application or ex parte reexamination, the phrase "after the appeal brief is filed" includes the time from filing of the appeal brief through the first of a decision by the Board, the mailing by the examiner of a rejection or other paper with a response period, the mailing of a notice of defective appeal brief, or the mailing of a notice of allowance. Effective March 19, 2013, 37 CFR 41.20(b)(4) sets a fee to forward an appeal to the Board after the mailing of an examiner’s answer. While appellants may desire an interview after mailing of an examiner’s answer and prior to payment of this fee, interviews during this time period are likely to confuse the record on appeal and are not permitted except in unusual situations. These unusual circumstances may include situations where appellant wishes to cancel all appealed claims and proceed to issue with claims previously indicated as allowable, or where the examiner is convinced that some but not all of the previously rejected claims are in condition for allowance. After the time specified in 37 CFR 41.35(a), the application or ex parte reexamination is no longer under the jurisdiction of the examiner. While the examiner has no jurisdiction over a proceeding after the time set in 37 CFR 41.35(a), the Director of the USPTO or appropriate delegate has the authority to remand the proceeding to the examiner under 37 CFR 41.35(c). Requests for interviews on cases under the jurisdiction of the Board should be granted only with specific approval of the Technology Center Director upon a showing in writing of extraordinary circumstances that justify a remand from the Board to the examiner in order to conduct an interview. Evidence means something (including testimony, documents and tangible objects) that tends to prove or disprove the existence of an alleged fact, except that for the purpose of this subpart Evidence does not include dictionaries, which may be cited before the Board. Record means the items listed in the content listing of the Image File Wrapper of the official file of the application or reexamination proceeding on appeal or the official file of the Office if other than the Image File Wrapper, excluding amendments, Evidence, and other documents that were not entered. In the case of an issued patent being reissued or reexamined, the Record further includes the Record of the patent being reissued or reexamined. The official record on appeal contains the items listed in the content listing of the Image File Wrapper or the official file of the Office if other than the Image File Wrapper, excluding any amendments, evidence, or other documents that were not entered or indicated considered by the examiner. Because an examiner’s refusal to enter an amendment, evidence, or other document is a petitionable matter that is not subject to review by the Board, the exclusion of such non-entered documents from the definition of "Record" reflects the fact that the Board’s review of patentability determinations is properly based on the record of all entered and indicated considered documents in the file. 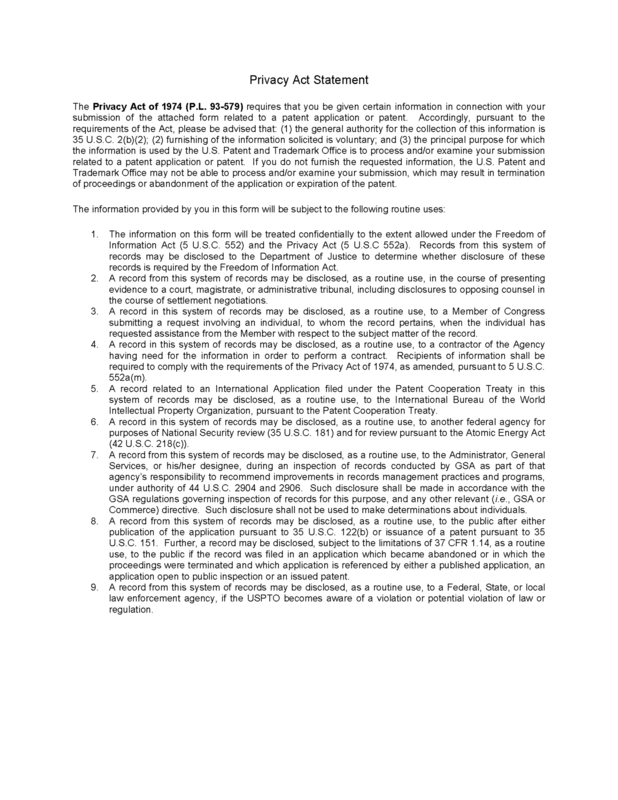 An information disclosure statement or petition that is held in abeyance while the Board possesses jurisdiction over the proceeding is not an entered or indicated considered document and therefore is excluded from the definition of ‘‘Record’’ until such time as it is entered or indicated to have been considered. The definition of ‘‘Record’’ includes the items listed in the content listing of the Image File Wrapper because, in some cases, physical items that form part of the official file are not able to be scanned into the Image File Wrapper and are maintained elsewhere, such as in an artifact file. Some examples of such items include original drawings in design patent applications and sequence listings. In such cases, the Image File Wrapper will include an entry in the content listing that points to this artifact file or other record. In the case of an issued patent being reissued or reexamined, the Record further includes the Record of the patent being reissued or reexamined. All references listed on an Information Disclosure Statement (i.e., Form PTO/SB/08a or 08b), which have been indicated as having been considered by the examiner, or listed on a form PTO-892 are included in the definition of Record even if each of the so listed references does not separately appear in the content listing of the Image File Wrapper. For the purposes of appeal, ‘‘Evidence’’ does not encompass dictionaries. Excluding dictionaries from the definition of ‘‘Evidence’’ thus allows appellants to refer to dictionaries in their briefs, which would otherwise be precluded under 37 CFR 41.33(d)(2) (absent existence of one of the enumerated exceptions). It further allows examiners to refer to dictionaries in the examiner’s answers without automatically rendering a rejection a new ground under 37 CFR 41.39(a)(2). Treating dictionaries in this manner is consistent with Supreme Court and Federal Circuit precedent, which contemplate that such materials may be consulted by tribunals ‘‘at any time.’’ See, e.g., Nix v. Hedden, 149 U.S. 304, 307 (1893) (citations omitted) (admitting dictionaries to understand the ordinary meaning of terms ‘‘not as evidence, but only as aids to the memory and understanding of the court’’); Phillips v. AWH Corp., 415 F.3d 1303, 1322–23, 75 USPQ2d 1321, 1333 (Fed. Cir. 2005) (en banc) (‘‘[J]udges are free to consult dictionaries and technical treatises at any time in order to better understand the underlying technology and may also rely on dictionary definitions when construing claim terms, so long as the dictionary definition does not contradict any definition found in or ascertained by a reading of the patent documents.’’) (citation omitted); In re Boon, 439 F.2d 724, 727–28, 169 USPQ 231, 234 (CCPA 1971) (holding citation to dictionary was not tantamount to the assertion of a new ground of rejection ‘‘where such a reference is a standard work, cited only to support a fact judicially noticed and, as here, the fact so noticed plays a minor role, serving only to fill in the gaps which might exist in the evidentiary showing made by the Examiner to support a particular ground for rejection.’’ (emphasis and internal quotations omitted)). Thus, 37 CFR 41.30 permits both the applicant and examiner to submit them to the Board during the briefing stage.